NEW YORK — Luke Kennard scored 17 of his 20 points in the second half as three players combined to score 39 points after the break and No. 14 Duke beat Clemson 79-72 in the second round of the ACC Tournament on Wednesday. After shooting 1-for-9 for three points in the first half, Kennard went 8-of-11 in the second half, as Duke advances to play fourth-seeded and No. 10 Louisville in the quarterfinal of the ACC Tournament on Thursday at Barclays Center. “I think that’s a heck of a performance when a player it isn’t going and then it goes that shows you’re a different player. You’re a special player when you’re able to do that,” Duke coach Mike Krzyzewski said. 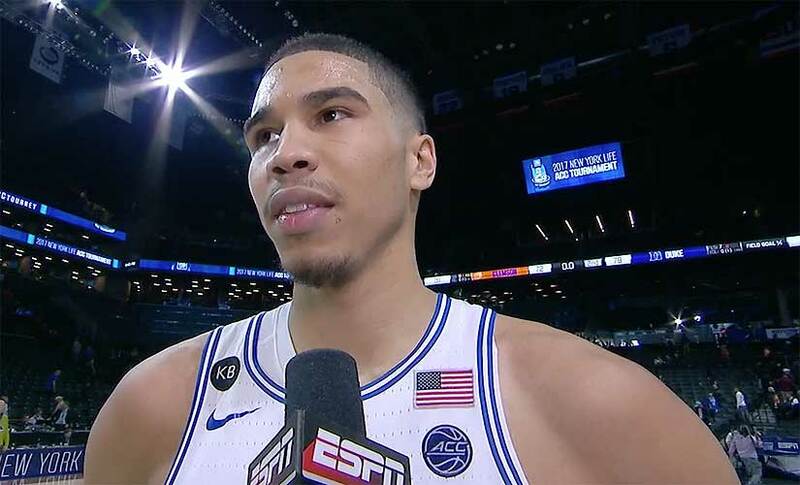 Jayson Tatum added 20 points, nine rebounds and four assists and Frank Jackson shot 7-for-10 and made both of his 3-pointers for 20 points for the Blue Devils (24-8). “The biggest thing I can take away from this is how much confidence my coaches, my teammates, they have in me,” Kennard said. Amile Jefferson finished with a double-double with 11 points and 10 rebounds, while Grayson Allen, still nursing a sore ankle and coming off the bench, missed all four of his shots and finished with zero points for Duke. Jaron Blossomgame led Clemson in the defeat with 19 points and eight rebounds. Shelton Mitchell scored 17 points, Marcquise Reed ended with 13, while Sidy Djitte finished with 10 points and 10 rebounds for the Tigers (17-15), who shot just 39.3 percent. Both teams went into the halftime break locked at 33 apiece, but Duke outscored Clemson 46-39 in the second half to setup the win. The Blue Devils twice led by 13 points in the second half before the Tigers trim the deficit to one point at 69-68 with 2:51 remaining. However, Kennard, Tatum and Jackson all made buckets from either the floor or from the free throw line to win the game for Duke. Regardless of the result in the next game, the Blue Devils are heading to the NCAA tournament. Clemson will not and is hoping to earn an NIT invite. “We won six (ACC) games. We probably needed to win eight or 10,” Clemson coach Brad Brownell said about getting into the NCAA tournament. “That’s obviously why today’s game was so important for our team. Early in the day, ninth-seeded Miami held off No. 8 seed Syracuse 62-57 in the second round of the ACC Tournament. Kamari Murphy had 16 points and 10 rebounds to lead the way for the Hurricanes (21-10), who advanced to play top-seeded and sixth-ranked North Carolina in the first quarterfinal Thursday. Wednesday’s defeat means the Orange have been left to sweat out another Selection Sunday to know if they get a bid to the NCAA tournament. In another ACC Tournament game, Zach LeDay had 31 points and 15 rebounds to lead seventh-seed Virginia Tech to a 99-90 victory over No. 10 seed Wake Forest.